NASA’s Mars Exploration Rover Opportunity is nearing a location on Mars at which its driving distance will surpass the length of a marathon race. Opportunity is headed for a portion of the western rim of Endeavour Crater where observations by NASA’s Mars Reconnaissance Orbiter have detected multiple types of clay minerals. These minerals are indicative of an ancient wet environment where water was more neutral rather than harshly acidic. 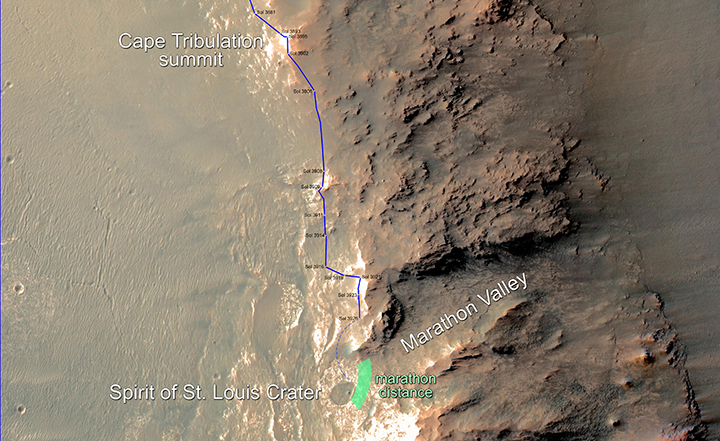 More than six months ago, the rover team informally named that destination “Marathon Valley,” having estimated what the odometry would total by the time Opportunity gets there.